How do we realize our full potential? By engaging with the world whole, across and beyond our professional life. Playing, exploring, observing what goes on outside of our habitual territory makes us more responsive and inventive. Design, done wholeheartedly, is lots of fun. The lot our family reserves for weekend gateways is wild woodland, most of it very steep. So instead of digging the earth and pouring truckloads of concrete, we built our tiny house up in the trees. As is often the case with design, the most constraining aspect of the project turned into its defining and most beneficial asset. We built fast and light. The bird's eye view is dreamy. Humidity and other uninvited guests are kept away, on the ground. This unusual setting, particularly distant from ordinary concerns, lifts the mind and encourages a poetic attitude. Graphic design is a kind of distillation: a large amount of detailed information is condensed to its most compact form, a simplified visual evocation. When I write a poem it seems the process is reversed. It is often from just one or a few small details, from a simple scene that I attempt to draw out a wide world of meaning. 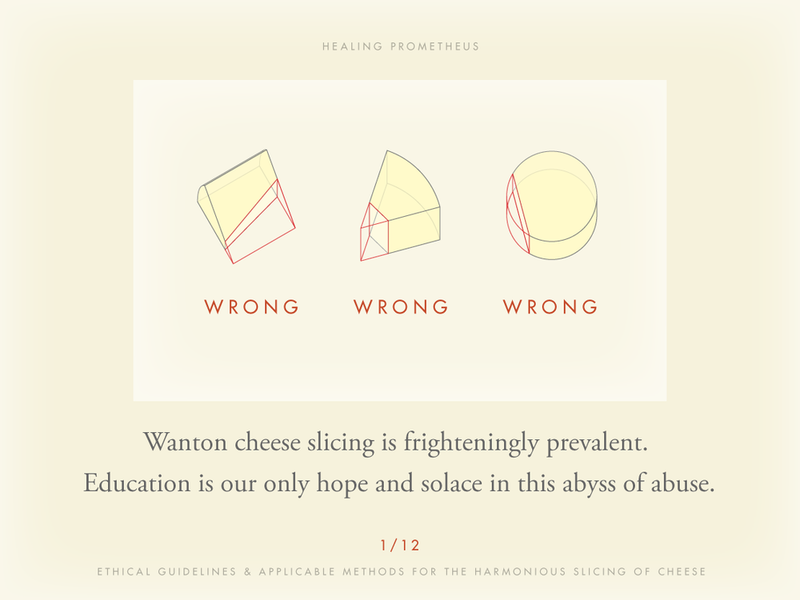 The processes of design and poetry inform each-other as they shift the scale of information and explore the connections between words and images. 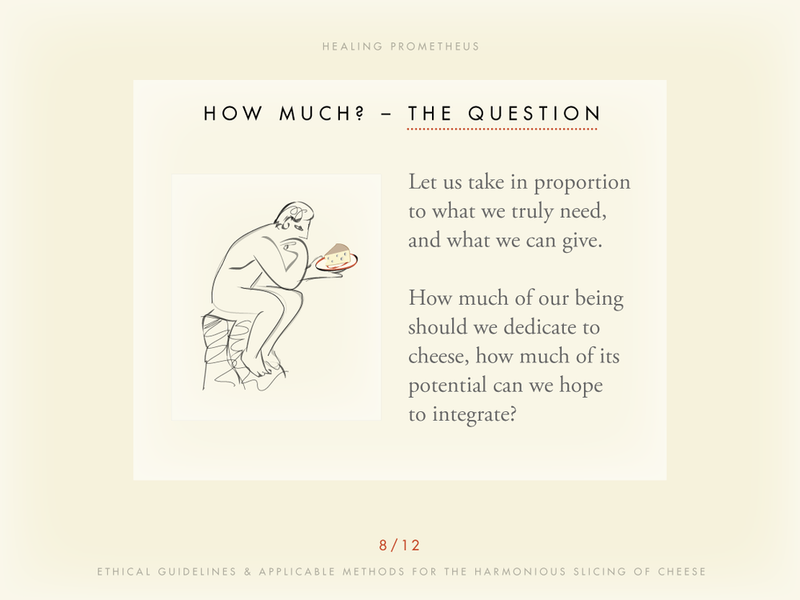 Buckling under intense popular demand –mostly that of my good friend Peter Montgomery– I am posting here a new edition of "Healing Prometheus - Ethical Guidelines & Applicable Methods for the Attentive Slicing of Cheese." I first gave this presentation on March 10, 2006 (my birthday) to address what clearly remains a deep concern. 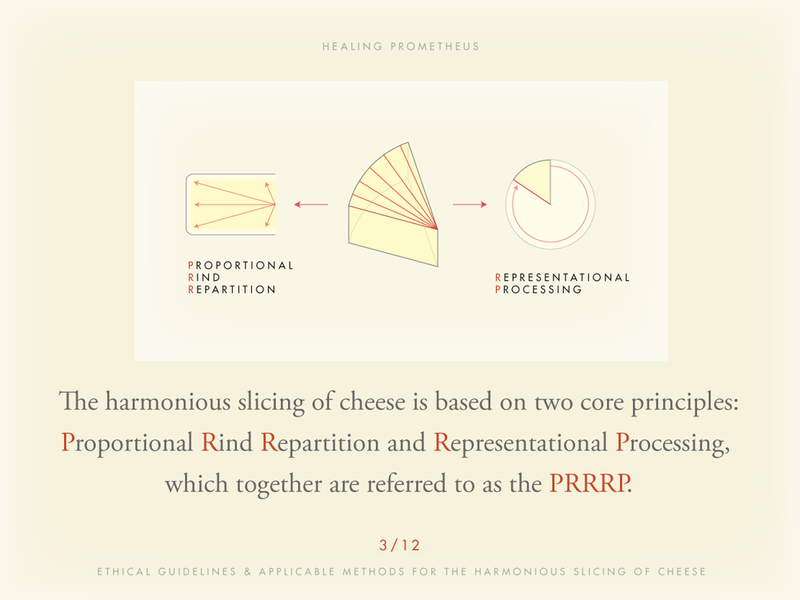 This slide deck offers cordial yet firm guidance on the fundamentals of cheese slicing: proportional rind repartition, relative experiential focus, representational processing, and more. Absolutely indispensable to anyone, especially those who, like Peter, might be coming over to my house for dinner.